What is Attar or perfume Oil? Attar is one of the Prized Posession of a Muslim .There is hardly any home where you won’t find Attar . Attar also known by the name “Ittar ” are highly concentrated Perfume and therefore are usually offered for sale in small quantities and have traditionally been offered in decorated crystal cut type bottles or small jeweled decanters. Attrar is so concentrated that a small bottle will last the user several weeks, if not months. Due to the purity and the nature of oils, there is very little chance of spoilage unless a food based carrier oil is used to cut the concentrated pure oil. Traditionally in the Eastern world it was a customary practice of nobility to offer ittar to their guests at the time of their departure. The ittars were traditionally given in ornate tiny crystal cut bottles called as itardans. This tradition of giving ascent to ones guests continues to this day in many parts of the Eastern world. The first impression of perfume is overwhelming to human senses, but it soon evaporates and loses power. Given its natural derivation, ittar lasts a long time. Body heat only intensifies its smell.A major difference between synthetic perfumes and ittar is that the oil-based ittar is worn directly on your body. A small drop is enough to be used as a fragrance on the body but Perfumes containing alcohol evaporates away quite fast and most of them are not safe to be applied directly on the Skin.. A few drops can be added to water and used with aromatic vapour lamps. The Storage and Shelf Life of Ittar is much better than alcohol based Perfume.-Ittar has a permanent shelf life and some ittars become stronger and smell better when they are older. and they become very aromatic. In Muslim World Perfume is more Synonymous with Attar. Attar are also known by the name Perfume Oil as they are Concentrated and need just a dab.Attar are much better than alcohol based Perfumes as they last longer. Attars have no side effects if directly applied on the skin or clothes and they may have therapeutic effects, but alcohol based perfumes cannot be used in a therapeutic way. They might be harmful due to the use of alcohol. Sometimes ,Attars can be more affordable and cheaper than other Perfumes because they are so concentrated that a small bottle will last the regular user several weeks or even months. Choice Of Attar .How to Choose Attar on the basis of Notes ? Do you Know that Attars can be classified based on their effect on human body . For Winters You need to Choose the Warm Ittars’ – Ittars such as Musk, Amber, Kesar (Saffron), Oud, are used in winters, they increase the body temperature and are perfect picks for the winter season. For the summer, it’s best to choose one made from ingredients that lower body temperature like .These are called Cool attars which are mode of ingredients like –Rose, Jasmine, Khus, Kewda, Mogra, Sandalwood . These are Perfect Pick for summers and are used keeping the body cool. While most Attar brands comes for both Men and Women.A smart way to choose Attar for a specific gender is to know its notes. Notes are separated into three classes; top/head notes, middle/heart notes, and base notes; which denote groups of scents which can be sensed with respect to the time after the application of a perfume. These notes are created carefully with knowledge of the evaporation process and intended use of the perfume. The presence of one note may alter the perception of another – for instance, the presence of certain base or heart notes will alter the scent perceived when the top notes are strongest, and likewise the scent of base notes in the dry-down will often be altered depending on the smells of the heart notes. Top notes are otherwise called the head notes. Perceived immediately upon application of a perfume,They form a person’s initial impression of a perfume and thus are very important in the selling of the product. The scent of a perfume that emerges just prior to when the top notes dissipate. The middle note compounds form the “heart” or main body of a perfume and emerge in the middle of the perfume’s dispersion process. They serve to mask the often unpleasant initial impression of base notes, which become more pleasant with time. The scent of a perfume that appears close to the departure of the middle notes. The base and middle notes together are the main theme of a perfume. Base notes bring depth and solidity to a perfume. Compounds of this class are often the fixatives used to hold and boost the strength of the lighter top and middle notes. Consisting of large, heavy molecules that evaporate slowly, compounds of this class of scents are typically rich and “deep” and are usually not perceived until 30 minutes after the application of the perfume or during the period of perfume dry-down.Some base notes can still be detectable in excess of twenty-four hours after application, particularly the Oud and musk notes. For Men Herbal and Exotic Perfumes are a good Choice.You cannot go wrong with Oriental Perfumes. As Nothing compares to the full-bodied aroma of oriental notes, these are some of the heaviest and most distinguished scents. If you need a Unique and Pleasant Smell,you would like to choose one with a unique blend of oriental resins, opulent flowers and spices such as cinnamon and nutmeg. These Notes are versatile and vivacious and will last throughout the day and night. While Choice of fragrance is truly Subjective to ones taste.We list to you the most famous Attar brand that are the Bestseller in their respective category .With lots of Positive review they are already a Best seller. You can buy them by clicking the names below or their images. It is a long lasting,Alcohol free perfume from one of the most popular perfume oil brands in the world: Haramain Madeenah” . The Fragrance Features citruses, orchid, rose, jasmine, saffron ,sandalwood and Cedarwood. It has a Sweet floral Aroma,the kind you will not stop loving.It comes in Glass bottle with roll-on and screw cap.It has a Masculine Scent and is very suitable for the Summer. Fragrance Notes: Madinah has a sweet floral aroma. If you can’t resist a strong perfume making a strong statement, Haramain Hajar is your perfect choice. A genuinely raw mix of brawn makes this a day-long companion in rough terrain. Just a dab is enough to last you through the sunshine and into the darkness. For those who are prepared to encounter a stormy night after a day that whizzes past like the breeze,this Attar is for you. Fragrance Notes : Hajar is quite a leathery scent.It Smells beautiful- slightly sweet ambery and floral leather. This Product is also from Haramain Madeenah -the most Popular Perfume brand Oil.This is alcohol free and is a roll on with a screw Cap.A little of Scent is enough to last for hours.You can definately give it a try. If You want a Sweet mild refreshing Musk that is long lasting,then this White Musk is for you.Once you buy this musk from ,you will definitely place it above all Other White Musks. Haramain has such a good quality and give you a fast shipping worth every penny.It has a long lasting Smell and comes in a handy roll on box like other Haramain Products. This Musk is Suitable for both Men and Women. Badar by Al Haramain Perfumes is a Oriental fragrance for women and men. The fragrance features patchouli, amber, musk, honey, lavender and rose. It is a beautiful oriental perfume with an Western attitude! Very fresh, slightly floral, patchouli/honey on a white-musk base is what all this scent is all about.It is more Masculine than being a Unisex.It is light comfortable with a Unique Scent and is good for Summer.Unfortunately this is not as long lasting as the Previous Perfumes.But I would like you to try it before judging It.It may become One of your Best Perfume.With a roll on and screw cap and handy Pocket size Pack this inexpensive Pack is worth its Price. Fragrance Notes: Badar has a sweet, easy to wear scent. This excellent attar or perfume oil comes in a beautiful velvet display box. The box, shaped like the Ka’aba in Makkah, opens up to reveal the exclusive perfume within. This is one of the most popular perfumes from the Al Haramain range. A manly (but we think the Attar Al Kaaba is suitable for women as well) fragrance for those who adore the scent of oudh (agarwood) from Cambodia. Similar to Montale’s Black Oudh minus the sweetness. An oil based long lasting fragrance. The initial scent is very powerful. Floral but still very nuetral(unisex). When you apply it on skin under your shirt, the smell lasts for about more than 10 hours. Attar al Kaaba is very pleasing,and is bound to get you noticed with nice compliments.The drydown is basically a rose scent with a touch of soft oriental feel. Now I m going to tell you about the most loved Attar .Oud is Considered as One of the best Attar in the Middle East. It is Unisex.Both Men and Women can Use It.But It is mostly Preferred by Men because of Its Strong Woody aroma. See the different types of Arabic Oud available Online. Arabian Oud is a famous brand which sells high quality Products .Sehr El Kalemat Unisex 100 Ml (100 ml) is One of its most loved Product. Dehn el Ood Mubarak is derived from rich extracts of Dehn El Ood from Cambodia & Indonasia captivates the aura of festivity and happiness. It has an enticing fragrance packed with lingering sweet, leathery & woody notes . It is a creative mix of exclusive ingredients, which is intended to evoke beauty and softness. The freshness and warmth of the aroma makes it adaptable for all occasions. The beautiful design of the bottle and the delicate outer packaging creates a picture of serenity and modernity. “Sultan has a Powdery Woody musk fragrance with white musk, oudh and very soft rose. It has a DEEP mystifying aroma. Popular among men. Oud doesn’t comes Cheap because it is made from Agarwood Wood which is very rare .If you are buying a Cheap Oud from somewhere ,definitely it is not a pure Oud. Sultan Pasha Attar : Sultan Pasha Attars are famous for their unique scent . They are expensive but they are worth it .In general, there are affordable sample sets if you wish to try things first .Each vial has between 2 to 4 drops depending on the fragrance’s rarity, cost of materials, and general availability. That’s enough drops for about 2 full, in-depth wearings or about 4-5 lighter, briefer ones. You can order them from their store in ebay and If you want to order a single attar ,The Best of Sultan Pasha’s attar are Ensar Rose and Inferno. Ensar Rose costs £500 for 3 ml. Artisinal Attar is £99 (roughly €150) for a 3 ml bottle. It contains a special variety of silver frankincense that is the signature note, for instance, is grown only in the Dhofar mountains in the south of Oman, and historically commanded enormous prices when exported via the Silk Road into Rome and Persia. To this day, it is painstakingly harvested from the trees by hand, as it has been for more than 1500 years and Rose Taifi which is the rarest and most precious oil extracted from rose petals, and is famed across the Gulf for its rich and romantic fragrance. Each flower produces so small an amount that an entire field of roses is required to produce each tiny bottle of Tribute. Because of this, the scent is so concentrated that even a small drop applied to the pulse points will last for many hours, over the course of which the attar will progress smoothly through several stages of development. For Women,the choice of Ittar is more of a floral,fruity,rose and amber note. Musk-Either Red Musk or white Musk,Oud and Oriental Perfume are a bit costly than Rose and Sandalwood but has a heavenly Scent and can be worn by both Men and Women. Woody notes within perfumes embody warm, earthy notes such as patchouli, sandalwood and amber. Woody notes are sensual and are very popular within the heart of a perfume. The beauty about woody notes is that they are versatile, enabling longer lasting perfumes throughout the day. You will find that woody notes are best complimented with hints of citrus or aromatic notes.Woody notes can be worn by both Men and Women. If you do not want to go wrong with your Selection of Perfume,try the floral Perfumes.Floral perfumes are by far the most popular women’s perfumes. Feminine, floral fragrances contain hints of beautiful flowers such as rose, violet and orchids to create an ultra-feminine appeal for women. Noora 20ml CPO Noora, meaning ‘divine light’ is a concentrated Mukhalat. This oriental composition starts with soft fruity notes of orange and honey which turns into floral notes of lily, rose and saffron. It has musk, sandalwood and vanilla notes in the end. Noora is very sweet, very spicy, very strong, very unique, very exotic, and lasts for a day until your next shower and beyond. This smell is very in your face. It is exactly what women want when they want to try an Arab perfume that is very different from American and European perfumes but don’t want something that has a heavy oudh smell, something that is like incense, or an older woman perfume. I have gotten a lot of compliments on this scent. It is one of my favorites and a big seller with Swiss Arabian. It is comparable to what a spicy hot tea with a lot of honey smells like while it is still steaming. These Swiss Arabian perfumes are of incredibly high quality for such a good price. Lamya is a sensational fragrance with lemon, rose oudh and musk. It Comes in an elegant bottle with purple stones on silver with a flower on cap. Lamya Make a wonderful gift for Women . Fragrance Notes :Lamya has a floral Fragrance. It’s a floral fragrance with notes of soft rose, amber and vanilla. Priced at 5.39 $ for 6ml. Fragrance Notes :It is a floral Woody Musk for females. It’s musky and floral; both blend well. It does smell strong at first … but give it about 10 minutes to soften. It’s easy to put on – and as the others have said, you need ONLY a dab. Once on each wrist and behind each ear. Smells Mature and priced at only 3.10 $ for a 6ml Roll On. It has a wonderful packaging and is such a great price for something that smells so expensive and refined. The vanilla in Choco Musk is soft, not overly sweet and not overpowering. The musk is woven into the fragrance with a nice balance. This smells so seriously good. First it is chocolate then it smell vanilla, then you smell the musk. You have to like sweet smells, the smells of chocolate cake/cookies/chocolate custard pies, if you do not like sweet smells, gourmands or baked goods smells of any kind then you will not like this. This is ridiculously cheap. If you are a fan of Comptoir Sud Pacifique Amour De Cacao, L’Artisan Vanilia EDT (Discontinued), or the Vanilla fragrances by Lavanila Laboratories, you may enjoy this lovely perfume oil. Ideal for wearing in autumn and winter. 6ml costs 5.39 $.It has pretty good review.Worth trying! Balkis is a soft floral that is powdery and slightly sweet. It tends to smell a bit on the ‘stronger’ side … let’s say like “Poison” or something similar to that. Not for anyone looking for a soft scent, but if you like a nice, strong, lasting scent … this is one you should check out! It is One of the best Smelling and Cheap Scent. You will Surely love it. Priced at Only 5.39 $ for 6 ml.It is Worth trying ! It is one of the designer fragrance that does not contain alcohol giving you the 4x effect of other designer fragrance. This one is a cheap alternative to a high priced n,high quality perfume .Loved by the women for its mesemerising smell and cheap price ,You will definately love it. Middle Notes Has Musk And Floral Notes and the Base Notes Has Woody And Ambery Notes .It comes in 10 ml bottle. Priced at around Rs 1,000 ,At most times it is available via amazon at a discount at around Rs 399. 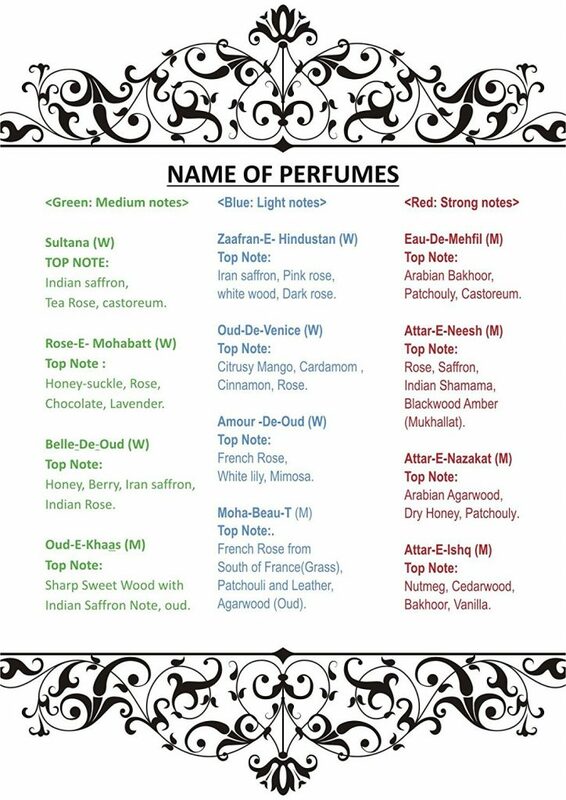 8)Attar e Nazakat is an Oud Perfume by Neesh. It has an unmistakable graceful and dry honey and Arabian agar wood smell. It is a Pocket friendly spray Ittar Perfume that can be sprayed about 450 times and is available at Rs 340 .You can get it via Amazon . If You are Male, You can Choose Oud e Khaas, Attar e Ishq, Attar e Nazaqat ,Attar e Neesh or Eu de Mehfil which are all strong notes that gets softer over time and lasts for around 10 hours. So these were few Perfume brands most loved and most brought.If you have your own favourite,do feel free to share your views. Hope You benefit from the Articles.If You like the Articles,Share! are these best 6 attars for women available in india ? For a Good attar at a cheap Rate, You can also try Iba Halal Care which has no alcohol,sulphates or Parabens . Jazak Allah Khair. If You have any More Query feel free to write to Us. KASHAF PERFUMERS in India also offers some finest and best attars in India. Assalamu alaikum and thank you for your beautiful article akhi. Since becoming Muslim it has been difficult to balance my life and Islam. I’m currently living in Malaysia and I would like to start my own Halal and Islamic business selling Attar. I have many friends from Turkey, Saudi, Egypt, and India. It is actually very cheap for me to fly to India so perhaps this may be the best place to start. My question is, how can I find quality uncut Attar? All of the oils I come across here do not last very long and sometimes they even make my sensitive skin itch. If you could help me with any more information I would appreciate it very much, Alhamdulillah. Jazakallah khairun. Complete and Comprehensive Information! Enjoyed reading the write up on attar from start to end. I was always confused attars with perfumes. But now with this insightful article, confusion is gone. One thing though I have seen the big brands of attars are still not available with major e-Commerce in Indian Marketplace. And the sellers they are available with are not a big name either. Glad that you like it .Thanks for stopping by to read this article. Enjoyed reading this articsl. Very informstive.